With this latest model Solaris surpasses the standards set by itself. 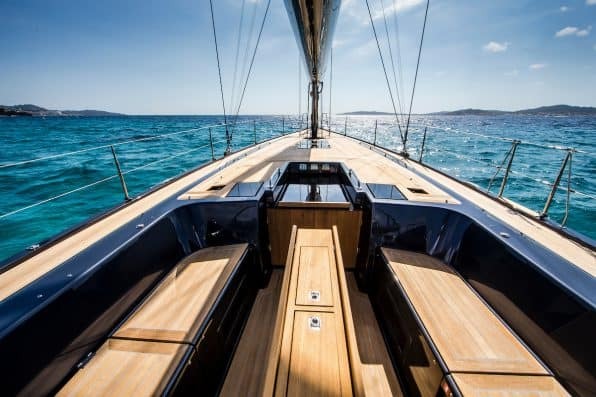 The Solaris 47 is the first and only model in this size to combine all the features and innovations to enable a high-performance boat to be easily sailed even with a small crew: recessed track for the self-tacking jib; only 2 winches at the helmsman’s position with which you can control all the lines; clear separation between the guest and crew areas; dedicated liferaft compartment with easy access; watertight large-size and functional sail locker; tender garage to stowing the tender and the outboard engine. The hull shape represents a refinement of the water lines already widely and successfully tested at sea with the Solaris 50 and 58. The weight distribution and the hull volume defines a high performance hull shape even in adverse sea conditions, with high stability coefficients to maintain sail area even in strong winds. As with all the yard’s models the production of the 47 follows the exclusive Solaris methods developing a strong and stiff monolithic hull. The interior layout with 3 cabins and 2 bathrooms was studied at the yard in a full size mock-up, only with this process can you truly test the ergonomics of all components designed in 3D; the interior layout has a classic galley to port with forward owners cabin. The craftsmanship in the joinery and the assembling of all components at the Yard ensures an enviable standard of quality. More info about the SOLARIS 47 yacht can be found here.